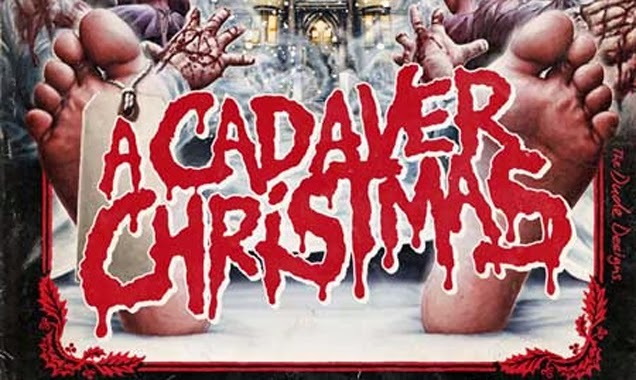 Well, kids, A Cadaver Christmas is pretty much what it sounds like. A low budget, poorly acted black comedy about cadavers coming to life. No, they are not zombies. They are cadavers. A cray-cray professor working in the cadaver lab at the University has been doing some off the books work and now a parasite has caused the cadavers to come to life. Enter the janitor, the drunk, the bartender, the cop, the cop's perp and a school security guard. This motley group takes it upon itself to exterminate the cadavers. The janitor has an extreme and amusing tenacity when it comes to cleaning up messes, so, he instantly becomes the group leader. If the janitor in your building looks like this, move. The really great thing about this movie is the way it looks. It looks like a grindhouse movie:scratchy looking film, cigarette burns and sometimes you even see the actual film go crooked across the screen. The acting is sub-par, but this feels intentional. The use of practical f/x is well done and there is plenty of blood to go around. Unfortunately, this is more of a comedy than a horror movie or even a horror/comedy movie. The emphasis seems to be placed on the humor and less on the horror. This is too bad, because the humor is mostly juvenile. The janitor has some awesome moments using ordinary tools ( a school desk, a snow shovel) as weapons and it's an, overall, very fun movie. Watching this movie every holiday season would be an easy tradition to observe, especially if you used it as a drinking game. This game isn't for lightweights, though; take a drink every time they say the word "cadaver" and you won't even remember the snarky things that your mother said at dinner.